WASHINGTON — A White House meeting between President Donald Trump, Senate Minority Leader Chuck Schumer, and House Speaker–designate Nancy Pelosi quickly devolved into an open, chaotic argument over the border wall on live television Tuesday. The spat ended with Trump threatening a partial government shutdown right before the holidays if he doesn’t get his border wall. The point of the meeting was to discuss border security funding ahead of a Dec. 21 deadline when part of the federal government, including the departments of Homeland Security, Justice, and State will shut down if a spending bill is not passed. Trump cannot shut down the entire government, however. Congress has already passed and Trump has signed funding bills for many other federal departments — including the departments of Defense, Health and Human Services, and Veterans Affairs — insulating them from a shutdown before the holidays. When government shutdowns occur, the affected agencies don’t completely close, but they operate at reduced levels. Federal employees whose function is deemed essential (such as US Border Patrol agents) continue to do their jobs, but nonessential employees are not allowed to work. Shutdowns also create uncertainty for some federal employees because they don’t get paid and it’s not immediately clear whether they will be paid again. At the top of the agenda for Tuesday’s meeting was the border wall, a campaign promise for which Trump requested $5 billion. Democrats are not willing to spend that much, and the wall remains the major item in dispute ahead of the funding deadline. Trump dug in on the idea of building the wall — which he originally promised Mexico would pay for — even as the political reality of it will become less feasible as Democrats take over the House next year. Ahead of the meeting, Trump had tweeted once again his false claim that Democrats want “Open Borders,” apparently looking to place pressure on Schumer and Pelosi ahead of the meeting. Pelosi was under additional scrutiny ahead of this meeting, as she is working to secure the votes to regain the speaker’s gavel in January. When Trump suggested she may not be able to speak easily in public because of this, Pelosi pushed back. “Please don’t characterize the strength that I bring to this meeting as the leader of the House Democrats who just won a big victory,” Pelosi said. Every time the president said “we need border security,” the Democrats agreed. They were expected to offer $1.3 billion in border security funding ahead of the meeting, but Schumer and Pelosi made abundantly clear they do not support a physical wall. The Democrats also urged the president not to have the discussion in front of the press. The meeting was not expected to be open to reporters, but the argument spilled into the open when Trump invited the press and television cameras in and began to speak about the wall and a possible shutdown, even opening the floor to Pelosi, who began to push back on the president’s initial remarks. Trump immediately interrupted. In a readout of the meeting, White House press secretary Sarah Huckabee Sanders said the meeting had a “constructive dialogue,” pointing to an agreement on criminal justice reform and the farm bill, both of which have bipartisan support, but acknowledged “major disagreement” on the wall. “President Trump was grateful for the opportunity to let the press into the meeting so that the American people can see firsthand that while Republicans are fighting to protect our border, Democrats are fighting to protect illegal immigrants,” Sanders added. 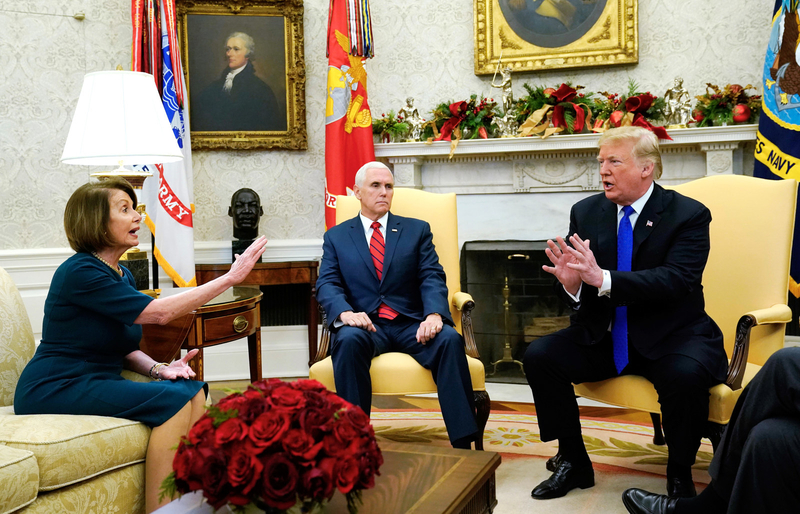 Vice President Mike Pence was also present for the meeting, sitting quietly as Trump, Schumer, and Pelosi argued. This was the first meeting the Democrats had with Trump since the midterm elections, where Republicans faced major losses in the House and widened their margin in the Senate. “I did. We did win North Dakota and Indiana,” responded Trump. After the meeting, Schumer and Pelosi spoke to reporters outside the White House. “This temper tantrum that he seems to throw will not get him his wall, and it will hurt a lot of people, because he will cause a shutdown,” Schumer said.